Aggressive sales of smaller tablets triggered a revised tablet sales forecast today by IDC, which upped its projections by 11% for 2013 and said Android would supplant Apple's iOS as the dominant operating system this year. "The shift to smaller screen sizes, and lower prices, is the driving force behind this transition from iOS to Android, and to larger shipments," said Tom Mainelli, IDC research director for tablets, in an interview today. IDC boosted its estimate of total tablet shipments during 2013 from an earlier 172.4 million devices to 190.9 million, a 10.7% increase. Today's revised forecast came just three months after IDC's last, when it raised estimates for 2013 by 4%, from 165.9 million to 172.4 million. According to IDC, one of two tablets shipped this quarter sported a screen 8-in. or smaller. Apple entered that space last October when it launched the iPad Mini, a 7.9-in. smaller sibling of the original iPad that, by some accounts, has seriously cannibalized sales of the company's larger model. Even at its debut, analysts criticized Apple for sticking with its premium pricing model: The iPad Mini starts at $329, while Google's $199 Nexus 7 sells for 40% less. The iPad Mini won't keep Apple in the driver's seat this year, Mainelli said. "The trend has been there, but this will be the first time Android overtakes iOS in the market," he said, citing his team's forecast for 2013-2017. For the year, Android-powered tablets will account for 48.8% of all devices shipped, edging iOS' 46%. During 2012, IDC pegged Android's share at 42.7%, iOS' at 53.8%. The new numbers represent almost an eight-point drop for iOS, and a six-point increase for Android as the two switch places this year on the sales share chart. 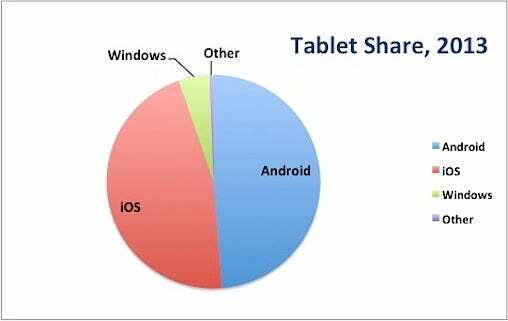 During the next five years -- IDC's standard forecast timespan -- iOS' share will continue to shrink. As will Android's. "Over the long term, Windows will start cutting into [iOS' and Android's] shares," predicted Mainelli. In 2017, IDC expects that Android's share will be 46% and iOS' at 43.5%, with Windows -- a combination of the full-fledged Windows and Windows RT, the tablet-specific, limited-function operating system -- accounting for 10.1%.